g003 WINGS linen one-sheet movie poster R29 previously unknown sound style! Wings, the 1927 William A. Wellman silent/talking World War I (WWI) military airplane aviation thriller ("To those young warriors of the sky whose wings are folded about them forever in this motion picture is reverently dedicated. "; "Story by John Monk Saunders"; winner of the Best Picture Academy Award) starring Clara Bow, Charles 'Buddy' Rogers, Richard Arlen, Arlette Marchal, Gary Cooper (in one of his first major roles! ), Jobyna Ralston, El Brendel, Richard Tucker, and Roscoe Karns. Note that Arlette Marchal was a French actress who had some success in American silent films. She was fourth billed when this movie was first released in 1927, but likely she had great trouble speaking English, because when the movie had dialogue added in 1929, she was no longer billed at all! Also note that Clara Bow was the most famous "flapper girl" of the mid to late 1920s (she became known as "The It Girl" after the character she played based on the popular novel by Elinor Glyn). She had a major role in Wings, and was Paramount's biggest star at that time. But she had a notorious private life and seemingly "settled down" when she married cowboy star Rex Bell in 1931 (she had two children and she retired from movies), but sadly in 1949 she went into a mental institution after a failed suicide attempt (she had had psychiatric issues for quite some time) and she was released but never returned to her family, and lived alone until her death in 1965. Important Added Info: Note that there is a huge amount of controversy about the posters for this movie! The posters that everyone agrees are from the very first 1927 release all have Charles "Buddy" Rogers, Richard Arlen, and Clara Bow given equal billing. In the last few years, posters have surfaced which give Gary Cooper equal billing to the top three stars. Some people have tried to insist that these are "first release" posters, and, in the sense that the movie had one long giant release from 1927 to 1929, they are technically correct, but the litho numbers on the posters with Gary Cooper's equal billing prove that they date from 1929, and are NOT 1927 posters (for those who care about that distinction). Two of the one-sheets from this silent 1929 release have sold at auction in the past two years, reportedly for amounts between $50,000 and $100,000 each! But now, we at eMoviePoster have unearthed a previously completely unseen "Wings" poster, also from 1929, but with a MAJOR difference from those that recently auctioned! 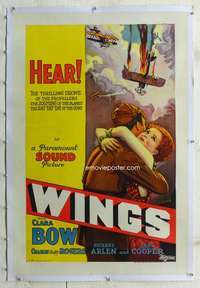 It is well known that "Wings" was one of the very last major "silent" productions, but until this poster we are currently selling recently surfaced, we were not aware that at some point in 1929, Paramount completely re-dubbed the movie with sound, and released a "sound" version in 1929! Yet, this "new" poster proves that, beyond a shadow of a doubt. By comparing the litho numbers on this poster to our huge database of litho numbers, we can determine that this poster is surely from 1929, which means that the movie was in "silent" release from 1927 through part of 1929, at which point Paramount created a "sound" version, and created all new posters for that version. We do not know if anyone else has ever seen any posters from this 1929 "sound" version of "Wings" (or lobby cards for that matter), and if anyone has, please contact me so I can post that information here. This poster has great stone litho artwork that is completely different from that which appears on any of the "silent" posters, and it has a new tagline, making certain that nobody could miss that the movie has now had a soundtrack added ("HEAR! The thrilling DRONE of the propellers, the ZOOMING of the planes, the RAT TAT TAT of the guns"), and they also put "a Paramount SOUND Picture" prominently on the poster as well! Condition: very good. The poster had three very tiny areas of paper loss in the left half of the middle foldline (really tiny, and blank yellow area only). There were stains, smudges, tears, and some areas of paper loss in the bottom half of the left blank border (blank white paper only), and similar stains, smudges, tears, and areas of paper loss in the top half of the right blank border (again, blank white paper only), and a few minor defects in the other parts of the blank borders. The image area of the poster had the tiny paper loss described above, and a series of six very tiny tears in the image background to the left of the burning plane. Other than the above very minor defects, the image area of the poster was in quite nice condition. There are some light black smudges in the left yellow background area, but these appear to be a minor printing defect (and in my opinion, the restorer made a really wise decision to not try to touch these smudges up at all, as they are not distracting, and to touch them up would give the poster a "restored" look, and it currently barely looks restored at all). The restorer did really expert restoration to the above blank border defects, and I think most collectors would never realize there had been any border restoration, even looking closely at the poster! Overall, the image area of the poster was in quite nice condition, and the poster was really well restored, and I would think any collector would be thrilled to have this great poster on their wall!